Aahmes Shrine Temple Legion of Honor was created as a Unit in 1932. In order to become an active member a noble must have served in one of the five (5) Armed Services of the United States or its Allies: Army, Navy, Marines, Air Force, or Coast Guard. Associate or Honorary Membership may be granted by vote of the Active Membership, however an Associate or Honorary member does not have voting privileges, he may not hold an elected office and he may not wear the International Shrine Legion of Honor Emblem. The first commander of the Aahmes Legion of Honor was World War I Veteran , Alden E Glaze. Among the original members of the Aahmes Legion of Honor was WWI Congressional Medal of Honor winner Bruno A. Forester, who was the Commander in 1934. There have been and there are currently many distinguished and highly decorated members of the Aahmes Legion of Honor who are veterans of WWII, Korea, Vietnam or Desert Storm. ALL SHRINE NOBLES THAT ARE VETERANS OF THE UNITEDS STATES ARMED FORCES OR ITS ALLIES ARE CORDIALLY INVITED TO APPLY FOR MEMBERSHIP IN THE AAHMES LEGION OF HONOR. WE WELCOME YOUR PARTICIPATION. For more information contact Bill Luttrell, Adjutant, at 510-793-2979 or e-mail whlutt@aol.com. 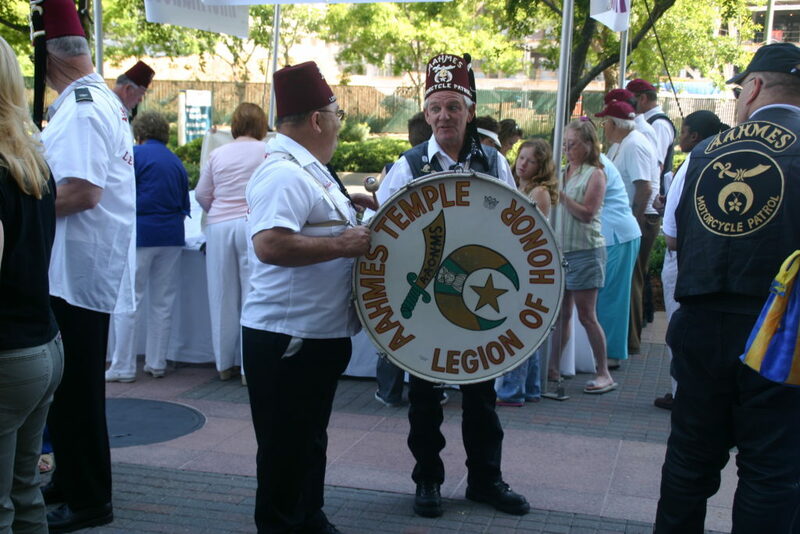 STATED MEETINGS OF THE LEGION ARE HELD ON THE SECOND MONDAYS OF EACH MONTH EXCEPT JULY & AUGUST AT THE AAHMES EVENT CENTER LOCATED AT 170 LINDBERGH AVE. LIVERMORE AT 7:30PM IN THE LOUNGE.